On the Shulchan Aruch, Yoreh De’ah, part 2. By Rabbi Hayyim Benvenisti. First edition, printed by the partners Yona ben Yaakov Ashkenazi. Rabbinical signature of ownership. Gloss on page 100/1. Rabbi Benvenisti (1603-1673 was a predominant rabbinical authority in 17th century Turkey. He was a student of Rabbi Joseph Trani and a brother of Joshua Benveniste. Born in Constantinople, he was appointed Rabbi of Tita (a town near İzmir) in 1644. In 1658, he was appointed one of the rabbis of İzmir. He authored several scholarly works, most notably the widely cited Shiyurei Kenesset HaGedolah and Kenesset HaGedolah, halakhic comments to the Arba'ah Turim and Shulhan Arukh. 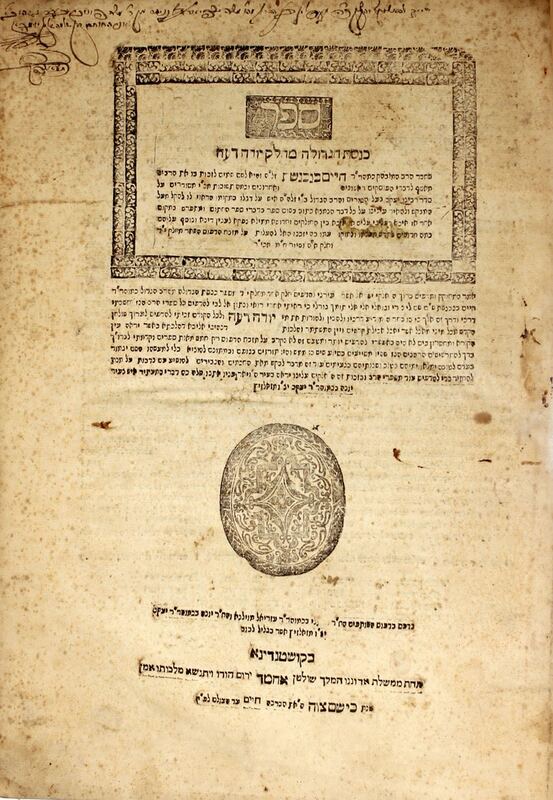 These two comments are characterized by an extensive analysis of halakhic sources from the mid-16th century to the mid-17th century. The Chida recommended that these comments be communicated prior to rendering any halakhic decision. Chaim Benveniste is also known to have compiled the two volume Questions & Responsa, Ba'ei Chayei, covering the four sections on the Shulhan Arukh. He was one of the leaders of those opposing Shabtai Zvi, and argued that he should be killed. | Thick pages, dark and quality. Wide margins. Stains from moisture. Moth holes on the last pages. , 206 pages. 35cm. Generally good condition.